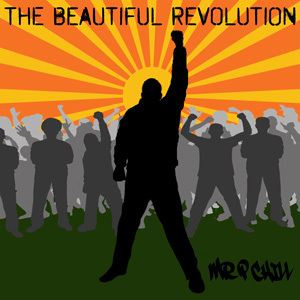 Mr. P Chill: "The Beautiful Revolution"
Unleashing The Beautiful Revolution on Inauguration Day 2017 was no coincidence. Revolution is on the minds of many today, including Sacramento rapper Mr. P Chill. The album opens with the title track, ending with an excerpt of Martin Luther King, Jr.'s sermon at the Ebenezer Baptist Church on April 30, 1967, known as "It's A Dark Day In Our Nation." Following the opener, "If These Tattoos Could Talk" delves into P Chill's autobiographical art emblazoned around his own body. An explanation of passion, loss, and spirituality, the song conveys what makes this emcee tick. Perking up the ears with a familiar loop, "Hello" samples Lionel Richie's 1983 hit single of the same name. But at the heart of the album isn't body art or catchy samples. "Dear Crooked Cop" drives a stake through the heart of recent senseless police brutality that has taken the news, the internet, and our nation's state of civil rights by storm. Mr. P Chill has released a video to the song, only 1'53" in length, but not short on calling out of reckless interpretations of the law and a citizen's right to be innocent until proven guilty. The Beautiful Revolution ends with a bit of inspiration and hope. In spite of the assaults many of us believe the new president is unleashing on our freedom, Mr. P Chill leaves us with some positivity. Longtime friend and tourmate Spyder D joins in this sing-song chorus echoing Marley's legendary refrain, "everything's gonna be alright." This month, Mr. P Chill launches a 14-city (and growing) tour in support of The Beautiful Revolution. He'll kick things off in his hometown, head up the West Coast, then down through Arizona and into Texas. Catch Mr. P Chill soon...and support his beautiful revolution.